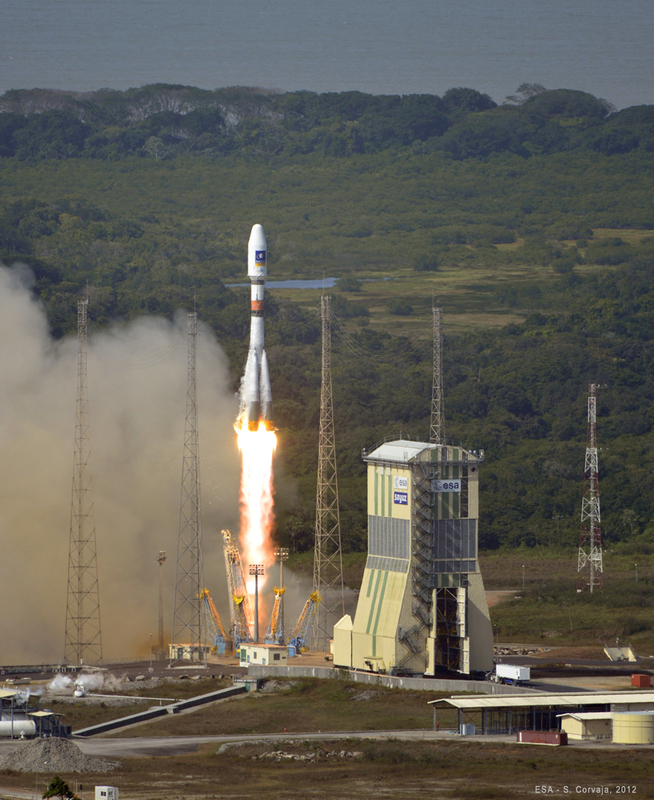 Arianespace’s third Soyuz mission from French Guiana – and the company’s seventh flight so far in 2012 with its Ariane 5 and Soyuz launchers – successfully orbited two satellites today for the European Galileo navigation network. Lifting off at 3:15:01 p.m. local time, which was the planned precise moment of launch, the Russian-built Soyuz ST vehicle was put through its paces to deploy the pair of Galileo In-Orbit Validation spacecraft during a flight of just under 3 hrs. 45 min. Noting that today’s mission occurred almost exactly one year after Soyuz’ historic first flight from the Spaceport, Arianespace Chairman & CEO Jean-Yves Le Gall said this new success underscored the “exemplary character” of his company’s cooperation with Russia. “In less than one year, three perfect launch successes from the Guiana Space Center have enabled us to demonstrate the operational effectiveness of this new launch system, and to confirm the relevance of our launcher family strategy,” he added. Good weather offered picture-perfect conditions for the Soyuz liftoff and climb-out from French Guiana, with tracking cameras following the vehicle through its jettison of the four first-stage boosters at almost two minutes into the flight. After the propulsive phases of Soyuz’ second and third stages, the Fregat upper stage took over to perform two burns – separated by a 3-plus-hour ballistic phase – enabling the two 700-kg. Galileo satellites to be released in a circular medium-Earth orbit, with an altitude targeted at 23,222 km. Today’s mission is designated VS03 in Arianespace’s launcher family numbering system, and was performed from the purpose-built ELS launch facility for its medium-lift Soyuz, located in the Spaceport’s northern sector near the city of Sinnamary. The pair of Galileo satellites was carried side-by-side on a dual-payload dispenser system, with their release performed in opposite directions by a pyrotechnic separation system that released them at the proper orbital insertion point. 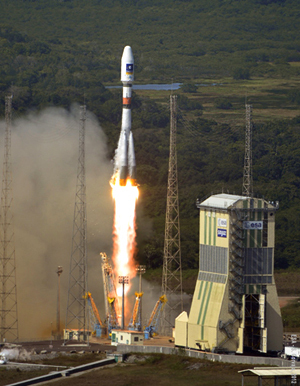 These spacecraft joined the initial two Galileo spacecraft orbited on Arianespace’s milestone VS01 flight on October 21, 2011 – which marked Soyuz’ introduction at the Spaceport. Together, the four satellites launched by Arianespace will form an operational mini-constellation – creating the minimum number required to allow navigational fixes for validations of the Galileo system. 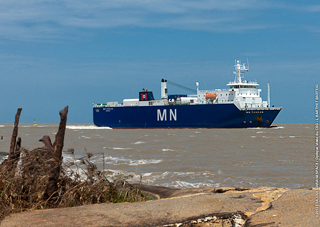 MN Toucan approaches the French Guiana coast on October 11 to deliver Ariane 5 elements for Arianespace’s VA211 mission. An Astrium-led consortium produced the satellites, with assembly and testing performed by Thales Alenia Space. Galileo is a European initiative, with the constellation of navigation spacecraft being developed in a collaborative effort of the European Union and the European Space Agency. Arianespace is keeping up the mission pace in 2012, with today’s VS03 flight added to five Ariane 5 launches already performed from the Spaceport so far this year – which orbited eight telecommunications satellites, along with an Automated Transfer Vehicle for servicing of the International Space Station. In addition, the Starsem affiliate of Arianespace used a Soyuz ST vehicle from Baikonur Cosmodrome in Kazakhstan to orbit a European weather satellite last month. Complementing this activity was the qualification flight of Arianespace’s lightweight Vega launcher in February, performed under responsibility of the European Space Agency with support from Arianespace. Arianespace’s next flight is set for November 9 from the Spaceport, employing an Ariane 5 to orbit the EUTELSAT 21B and Star One C3 telecom satellites. While preparations for this mission – designated VA210 – are underway, the Ariane 5 for the subsequent VA211 heavy-lift mission was delivered to French Guiana yesterday by the MN Toucan sea-going transport ship. Also at the Spaceport are launcher components for Arianespace’s three upcoming medium-lift Soyuz missions – beginning with a November 30 flight to orbit the French Pléiades 1B very high resolution optical observation satellite.